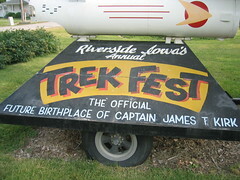 Riverside, Iowa: The Future Birthplace of James T. Kirk. The WHAT?? Admittedly, although I'm a geeky engineer who should know of such things, I've never really been a Trekkie. . . or Trekker. . . or Treksperson or whatever the politically correct term is. However, we were intrigued to see this gem of a town. Evidentially, in the original Star Trek series, Captain Kirk's birthplace was noted as "someplace in Iowa." The town of Riverside beat everyone else to the punch and asked for permission to be the "Future Birthplace of James T. Kirk." And so it became. 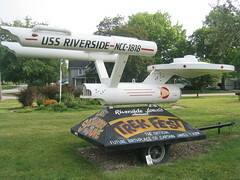 During non-Star Trek Convention times, the only thing to see is the model of the Enterprise (on wheels, so it can be used in a parade at a moments' notice) in the center of town. I'm sure during the Trek-fest, the town is overrun with characters dressed up as. . . well, characters. Otherwise, this is a sleepy town just a stone's throw off the beaten path and definitely worth a visit.